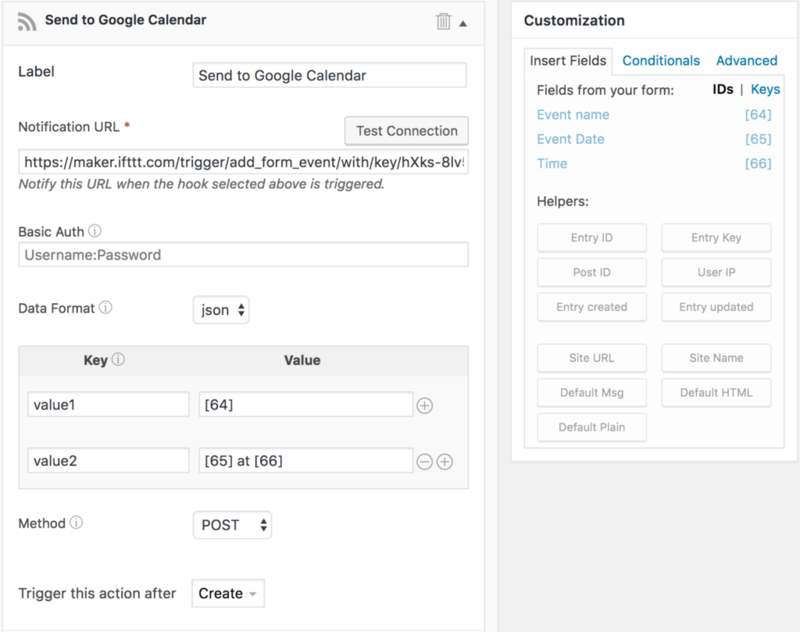 Add events to Google calendar straight from your site. Setup an IFTTT applet, create your form, and tell your form where to send the data. You'll need our API plugin. 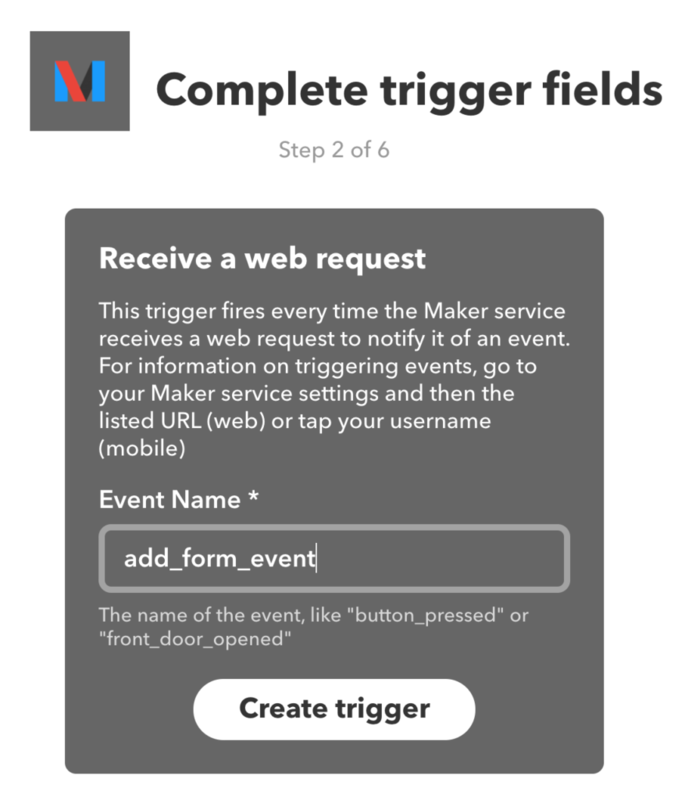 IFTTT has a service called Maker. It allows you to send pretty much any data into it. You can then tell it to trigger other events. If you don't yet have an account for IFTTT, go ahead and create one. Now, you're ready to create an applet. You'll see 'if ✚ this then that' on the page. Click on '✚ this' to choose what happens first. Search for 'Webhook' and click on the Webhooks block. Click 'Receive a web request' on the 'Choose trigger' page. Choose your event name. You can use whatever you would like. We'll use add_form_event for this example. Click on "✚ that" to choose your action. 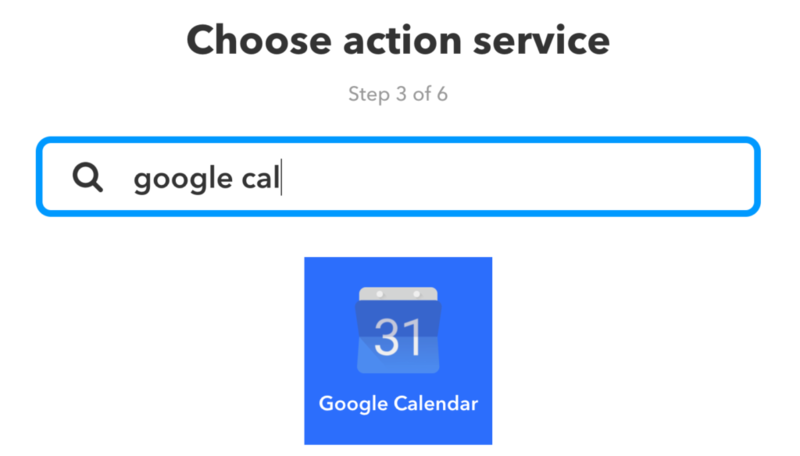 Search for 'Google cal' for your action and click on the Google Calendar block. Click the Connect button. 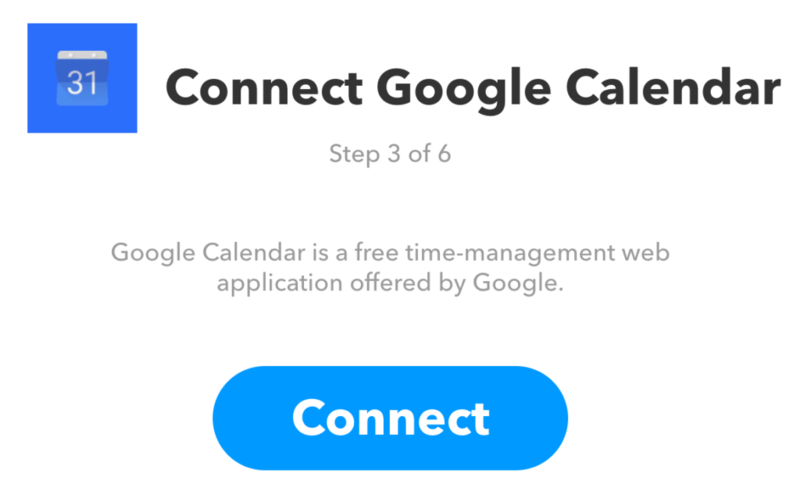 Allow IFTTT to add events to your account. Click 'Quick add event' on the 'Choose action' page. Next, clear out the text in the 'Quick add text' box. Click on the 'ingredient' button to insert Value 1 and Value 2 into the box. 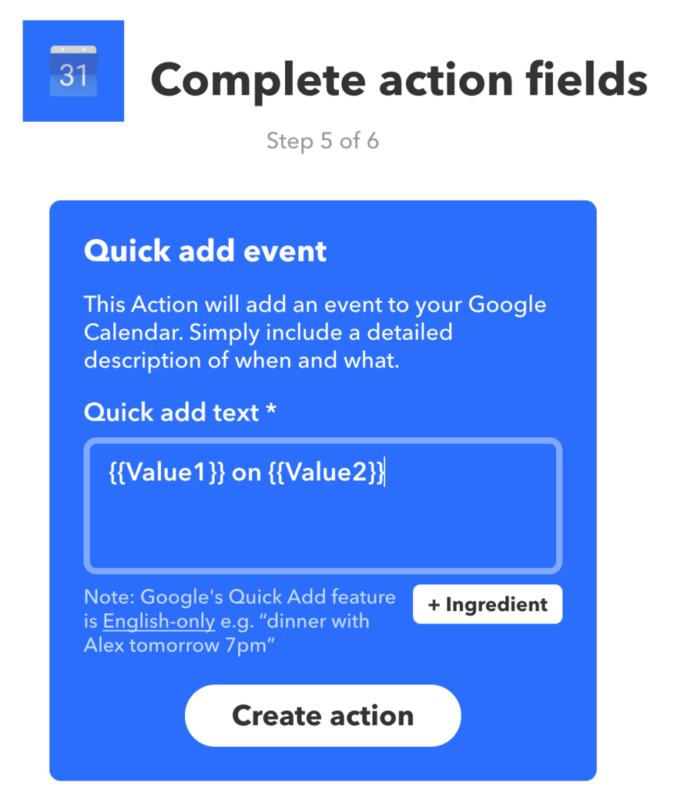 Value 1 is a placeholder for the event name, and Value 2 is for the date and time. Click 'Create action'. Here's an overview of the entire applet. If you don't already have a Formidable form to collect your events, create one now. Be sure to include a date field and a field for the event name. You can also include a time field. Go to the settings page for your form, and then the Form Actions tab. Click on the icon to add an API action to your form. Now we need the notification URL and secret key. To find this, go to the Maker service on your account and click the Settings link. Be sure to replace add_form_event with the name you used in Step 4 above, and hXks-sdflkj3-fwkejlk with the value in the settings page URL. You can leave the 'Basic Auth' box empty. Add two rows into the box for key/value pairs. Use value1 with the event name field, and value1 with the date and time fields. This is case sensitive. You're all set. Now go ahead and submit an entry in your form to add events to Google calendar. Please note that IFTTT has frequent delays between the trigger and the action. They say it may take an average of 15 minutes to trigger, but our tests took about 30 minutes.